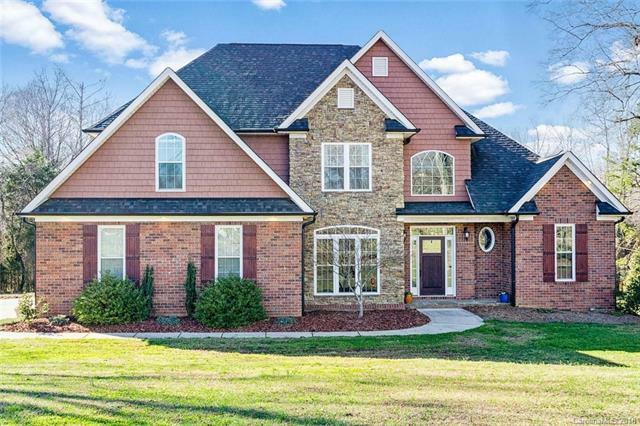 10033 Arlington Church Road, Mint Hill, NC 28227 (#3367165) :: Robert Greene Real Estate, Inc. Enjoy 5 Acres on immaculately owned private lot with this 2012 custom, brick home. Exquisite craftsmanship with high ceilings, and a large gourmet kitchen w/ custom easy glide cabinetry, high end appliances and plenty of storage will keep any chef busy and any family satisfied! Home features two fireplaces, one off the kitchen in the "keeping room. Spindle stairs and crown molding are accented by natural light coming through the atrium windows. Additional parking and storage in the separate detached garage. Less than 2 miles from 485, only 20 minutes to uptown Charlotte, close to dining parks and recreation but still on a private, wooded lot tucked away on a quiet street.